Inspiring, breathtaking, and always authentic; this itinerary showcases East Africa at its finest. The destinations ignite the imagination. You'll be immersed in the great spectacles of the Serengeti, Ngorongoro Crater, Maasai Mara, Amboseli, and Lake Nakuru. Then, there is the incredible diversity of the lesser-known parks like Tarangire and Lake Manyara. This itinerary is about indulging in an unforgettable safari experience, one that shows you African wildlife in all its nuances and wonder. Your accommodations during this safari are Miti Mingi Eco Camp in Maasai Mara National Reserve, Citymax Hotel in Lake Nakuru National Park, Amboseli Kimana Camp in Amboseli National Reserve, Arusha Tourist Inn Hotel, budget camping inside Lake Manyara National Park, Seronera Campsite in Serengeti National Park, Simba Campsite in Ngorongoro Crater, and Tarangire Campsite in Tarangire National Park. Budget Holiday Safaris will pick you early in the morning from your hotel or from the airport, bring you to the office for a short briefing of the safari and later depart for Maasai Mara via the Great Rift Valley. Your first stop-over will be at the Rift Valley viewpoint where you will take a few minutes to see the scenic views of this amazing landscape. Later, you will proceed for your safari with your lunch en-route in a Maasai town called Narok. You will arrive in time for your first game drive at this famous game reserve. The Big Five can be found in this park and many more species like the cheetahs, zebras, giraffes, warthogs, waterbucks, antelopes, wildebeest, and many more. Dinner and overnight at the camp. You will have an early morning breakfast and proceed for a full-day game viewing in the reserve. The Maasai Mara savanna grassland plains present a very scenic landscape filled with different wildlife species. You can also be one of only a few fortunate people to glide in a hot air balloon over the Maasai Mara plains (available at supplementary cost by pre-arrangement). The Big Five can be spotted in this reserve as well. Thomson's and Grant's gazelles, impalas, elands, topi, and large herds of zebra are also found through the reserve. Other wildlife inhabiting this reserve are lions, leopards, cheetahs, hyenas, Maasai giraffe, wildebeest, baboons, warthogs, buffalo, and elephants. You will have your picnic lunches beside a hippo pool as you view the hippos and crocodiles. You will proceed for game viewing till evening. You have the option of visiting a Maasai village for a cultural experience at an extra cost. Your dinner and overnight will be at the camp. You will wake up early and start an early morning game viewing tracking wildlife. After that, you will go back to the camp and have your breakfast and depart for Lake Nakuru. Depart the Mara region for Nakuru, lunch en-route with scenic views of Mount Longonot and Lake Naivasha from afar on the main highway. Lake Nakuru National Park is an important haven for endangered species, particularly the Rothschild's giraffes and the black and white rhinos. Lions, waterbucks, zebras, buffalos, and baboons are also residing here. Your dinner and overnight will be at a budget hotel. After breakfast, proceed on a game drive in Lake Nakuru National Park. Lake Nakuru has more than just flamingos. This is a major national park and an important sanctuary for rhino. There are huge herds of waterbuck, zebra, buffalo, the endangered Rothschild's giraffe and both black and white rhino are found here. A full day in this magnificent park. Amboseli National Park is situated at the foot of Africa highest mountain, Mount Kilimanjaro which snow-capped peaks presents a splendid view during clear days. The park offers some of the best opportunities to see African wildlife because its vegetation is sparse due to the long dry months. It is renowned for its large herds of free-ranging big African elephants. There are over 900 African elephants in Amboseli as well as many other animals including giraffes, cheetahs, African lions, monkeys, zebras, hyenas and antelope, and bird species. Your dinner and overnight will be at the camp. You will have an early morning game drive and return to the camp for your breakfast. Later, proceed to the Namanga border where you will catch your shuttle bus to Arusha. You will arrive at your hotel for relaxing and resting as you wait to start the safari the following day. (Dinner on your own). After breakfast in the hotel, you will depart for Lake Manyara National Park arriving in time for afternoon game drives. Dinner and overnight at a campsite. Lake Manyara National Park is mirrored by its varied fauna, with some of the more common and visible large mammal species being the buffaloes, elephants, giraffes, zebras, lions, and wildebeests. Prominently renowned for its tree-climbing lions, Lake Manyara is also home to troops of baboons and blue monkeys. The park is rich with fantastic birdlife, more than 200 species of birds can be seen here. You will have early morning breakfast. Depart the camp and proceed to Serengeti passing through Olduvai Gorge, the archaeological site of the Leakey family. You will have an afternoon game drive in Serengeti National Park. Your meals and overnight will be at Serengeti Seronera Campsite. You will have an early morning game drive in Serengeti National Park, later on, return back to the campsite for breakfast. Check out of the camp and drive with packed lunch game viewing en route to Ngorongoro Crater Rim. You will pass the Olduvai Gorge and you can visit the Olduvai Gorge museum at an extra cost. Ngorongoro Crater is the world biggest whole volcanic caldera at 8300 square kilometers and is arguably the most stunning arena. It is frequently described as one of the wonders of the world, not only because of its geological magnificence but also because it serves as an extraordinary natural sanctuary for some of Africa largest population of large mammals. Dinner and overnight at Ngorongoro Simba Campsite. After breakfast, drive to Tarangire for afternoon game drive. Meals and overnight at Tarangire Campsite. Tarangire National Park has some of the highest population density of elephants anywhere in Tanzania, tree climbing African pythons and its sparse vegetation, strewn with baobab and acacia trees, makes it a beautiful and special location. Enjoy breakfast after which you will be transferred back to Arusha. Thereafter, have lunch and leave the park viewing your last game while you drive back to Arusha arriving in the afternoon. You will be dropped at your hotel (dinner on your own). After breakfast in Arusha Center Inn Hotel, you will be picked to catch the shuttle bus back to Nairobi arriving in Nairobi at 14:00 or be transferred to Jomo Kenyatta International Airport (NBO) to catch your flight home or to other destinations. 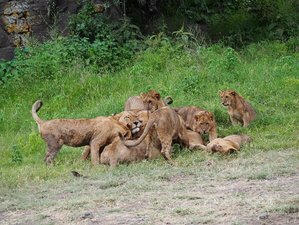 This safari will take you to Maasai Mara National Reserve, Lake Nakuru National Park, and Amboseli National Park in Kenya, and also Arusha, Lake Manyara National Park, Serengeti National Park, Ngorongoro Crater, and Tarangire National Park in Tanzania. During this safari, vegetarian and regular food will be served. Please book your flight to arrive at Jomo Kenyatta International Airport (NBO). Transfer from and to the airport is included. Budget Holiday Safaris will pick you up from the airport.